The Tropitone® Valora™ Jado Collection offers everything a five-star café or poolside bistro needs. With stackability, durability, flexibility, and versatility, Jado was designed to be practical and good-looking. Jado dining and side chairs stack six-high, allowing for convenient, efficient storage. 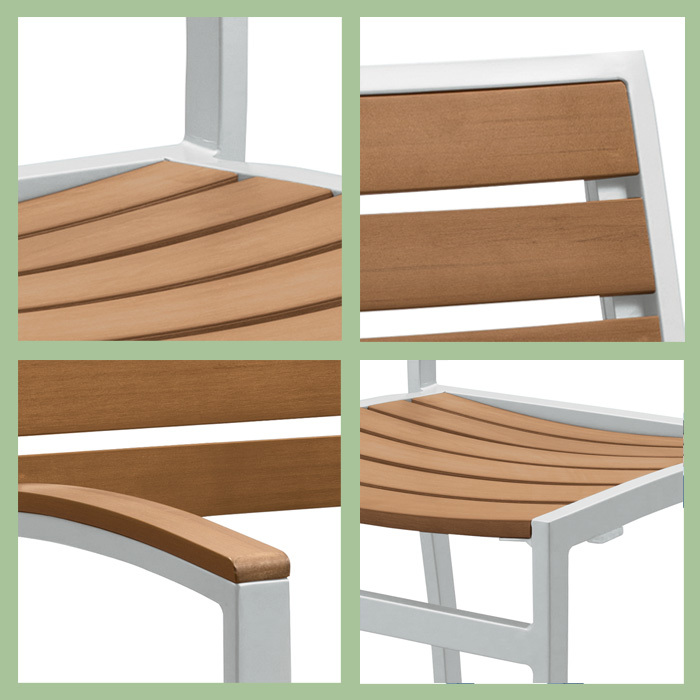 Jado features an all-aluminum frame with rugged faux-wood slats in the seat, back, and caps for the arms. The sealed faux-wood surfaces make cleaning easy with just a simple wipe-down. Select from a variety of different powder-coat frame finishes with complimentary stained faux-wood slats. The Jado faux-wood-slat dining chair and stationary bar stools also offer the flexibility of both arm and armless versions. The Jado Collection is made to withstand the elements and can stylishly suit any kind of outdoor setting.